We saw something really neat recently. JC and I were at the Guide's Fly Shop and on the wall, toward the back, was a shadow box. 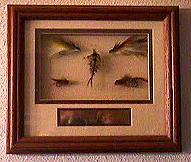 Fly tiers and lovers of flies often frame some favorite fly in a shadow box for their den, but this one was different. In the larger part of the shadow box, was a wonderful photograph of an angler and her fish. Then in the rest of the space, (which was divided into a couple of parts) were a couple of flies glued onto sea shells! So a little physical piece of the trip was included to make the whole piece more meaningful. It was a knockout! We have a couple of 'fly plates,' mostly small collections of flies tied by folks we know and fished with. Or some by the tier who created the fly. JC had little brass plates made for them with the tiers name engraved on them. One of the local jewelry stores did that quite inexpensively. It's a nice way to preserve a little piece of personal history. You probably have seen the Historical Fly Plates our friend Mike Croft makes, which are toward the bottom of his cartoons here on FAOL. Those are super since they each have a historic fly and its' history. Some of us would never see one of the historic flies any other way - much less know the history. One of the most outstanding 'fly plates' I've seen was on the wall at Bob Jacklin's Fly Shop in West Yellowstone Montana. It was a shallow shadow box, not as deep as most I've seen, and much larger than the usual ones. Probably the overall size was 20" x 26." At the top was written a graceful script, the name of the fly, (an Atlantic Salmon fly) and below the name was the actual fly. Arranged below the fly, as a collage, were all the items and materials necessary to produce the fly. The floss was not just a dinky piece, it was a strip, attached so it flowed in an "S" shape. Each of the feathers were also attached. Every bit used was there. The name of each material was handwritten alongside the actual material. As I recall the fly plate was created by a Frenchman who was guiding in the region. It was certainly a lovely piece of the tiers art - and just art in itself. You can create your own memory box, either using your favorite flies and maybe a photo of your favorite place to fish them. Little stones, twigs, moss can all be used to embellish it - and you could mount a fly on a twig or stone. Lots of possibilities. Some fly shops sell empty shadow boxes, crafts and fabric stores stores, (like Michaels-Arts and Crafts or Ben Franklin) have a large variety in size and color. If you're looking for a different way to commemorate a special trip, vacation - or a kid's first fish - the shadow box is a neat idea. You can produce them to match a special decor, or keep the whole thing rustic.